the current restriction that prevents the Chief Executive from being a member of a political party is to remain. Faculty members have been active in offering a diverse range of commentary on the government's proposal. 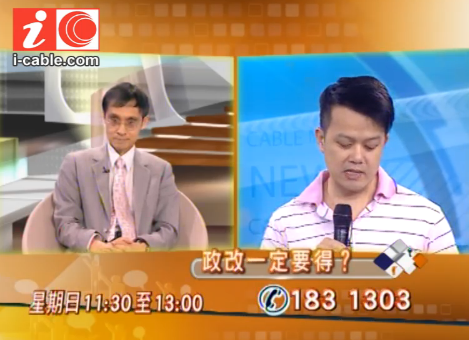 Professor Albert Chen was interviewed on Cable TV on 26 April 2015, answering questions from a studio audience. In an earlier interview on 23 April 2015 also on Cable TV, he advocated a code of practice to inform nominations by NC members to ensure a broader spectrum of candidates will be nominated. His proposals were explained in reports in the South China Morning Post (24 April 2015). On 23 April 2015, Professor Michael Davis was a member of a panel discussing political reform on the Backchat radio programme on RTHK Radio 3. His views were also quoted extensively in international media. Associate Professor Benny Tai wrote on "Only referendum can tell true public opinion about reform plan" for the Hong Kong Economic Journal, published in English on 27 April 2015. Professor Simon Young contributed an op-ed in the South China Morning Post on 30 April 2015, arguing that the pan-democrats should counter-propose an increase in the maximum number of nominated candidates to five. On 30 April 2015, Professor Johannes Chan expressed the view to RTHK that he did not believe the electoral method would change after 2017 if the current proposal was now accepted.